James Hathaway’s call for a solution to the global refugee crisis is as bold as it is idealistic, but is it realizable in the world in which we live? His solution seems to rest on the creation of “a binding way” to “share out fairly” the allocation of burdens and responsibilities to states that refugees have not yet entered. Such a binding obligation would then be administered not as an exercise of state authority but rather through “a revitalized UNHCR” with authority to “administer quotas.” In short, it appears that this proposal advocates a role for UNHCR to establish binding quotas on states to admit refugees from countries of first asylum, according to their capacity to receive, process, and integrate them. If Europe can be seen as a regional pilot project for such a global scheme, the results have not been promising. Using its qualified majority vote system to bind recalcitrant member states, the EU has largely failed to convince its members to participate in relocating asylum seekers from countries of first arrival to other EU member states according to their capacity to receive them and process their claims. The EU relocation scheme, at the time of this writing—more than four months since the plan was announced—has relocated fewer than 500 of 160,000 slated for transfer. So, it is hard to imagine that countries would subscribe globally to Hathaway’s more ambitious scheme, or that they would willingly bind themselves to responsibilities toward refugees who are not already on their territories. The pathetic response to UNHCR’s repeated admonitions on the need for more refugee resettlement places is similarly discouraging—though hope springs eternal as advocates anticipate the March 30 “Resettlement Plus” pledging conference. The increasingly restrictive attitudes we are seeing in Europe do not bode well for expanding UN authority to tell countries to accept more refugees.My instincts as an advocate for refugee rights are to promote Hathaway’s model as a way of sharing responsibilities equitably among states, according to their capacity to protect and integrate refugees rather than the happenstance of their geographical location. His model, if implemented, would without doubt enhance enjoyment of the human right to seek and enjoy asylum from persecution in other countries. It would guarantee countries that keep their borders open to asylum seekers that they will not be overburdened by the presence of refugees beyond their absorptive capacity. But the increasingly restrictive, beggar-thy-neighbor attitudes we are seeing in Europe do not bode well for expanding UN authority to tell countries to accept more refugees. The outgoing UN refugee chief, Antonio Guterres, said at the 2015 UNHCR Executive Committee meeting, “If there is one protocol that is yet to be drafted to complement the 1951 Convention, it is one on international solidarity and burden sharing.” UN Secretary General Ban Ki-moon has announced a summit meeting on September 19 intended to secure a Compact on International Responsibility Sharing, where world leaders will (hopefully) make more formal commitments toward solidarity with refugee host states. Hathaway surely has an eye on this development as he promotes a revitalized UNHCR. In this regard, this critique notwithstanding, I can only wish him well. Yet I still have a few bones to pick with his conclusions. The Refugee Convention may or may not be as “wonderfully flexible” as Hathaway asserts for its ability to identify new groups of fundamentally disenfranchised people, but its limitation is more fundamental than that: its drafters failed to incorporate article 14 of the Universal Declaration of Human Rights and to codify the right to seek asylum as a binding right. The drafters of the Refugee Convention were unwilling to suggest any right of entry for the purposes of seeking asylum other than as, at best, a corollary to the principle of non-refoulement for a person fleeing directly from the country of persecution. 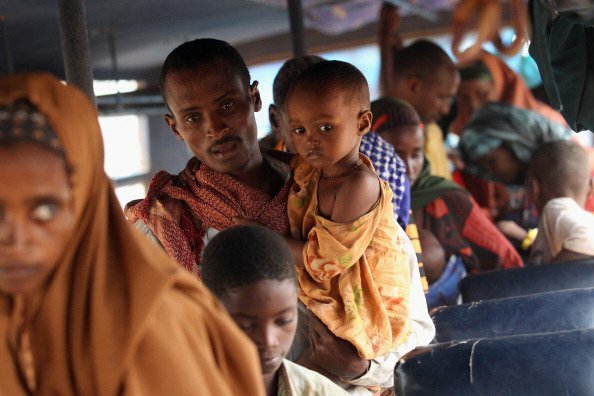 Refugees fleeing Somalia prepare to enter the Ifo refugee camp in Dadaab, Kenya. Article 35 of the Refugee Convention calls on contracting states to facilitate UNHCR’s “duty of supervising the application of the provisions of this Convention.” This presents two problems for Hathaway’s scheme. The first is that applying the Convention’s provisions rests with contracting states. UNHCR’s role is to supervise their implementation, not itself to implement its provisions. Second, the Convention’s provisions do not spell out how its principles should be applied with respect to asylum procedures, refugee resettlement or financial burden sharing. As a matter of principle, he posits that migration should be considered the means for protection and not an end in itself. That means that barriers to entry should be lifted because most refugees want to return home and often are able to do so. He implies that most refugee situations will be resolved within five to seven years, ending with durable changes in the country of origin that would allow refugee status to end because the conditions that had caused the person to become a refugee would have ceased to exist. In reality, however, most of the major causes of refugee flows—in Syria, Afghanistan, Somalia, among others—have proven far more intractable, resulting in protracted situations extending in some cases well beyond five to seven years. This suggests that Hathaway’s recommendation that resettlement or integration “be guaranteed” to those still at risk after this period would be the rule rather than the exception. While permanent immigration might not “necessarily” follow from protection for the duration of risk, in many cases it would. Governments are not likely to be taken in by Hathaway’s well-meaning arguments. The reality is that a rights-respecting regime of the kind Hathaway advocates—in which refugees are accorded freedom of movement and the ability to pursue livelihoods—means that they will be building equities and moving progressively toward integration. Their removal after a protracted stay, in fact, will be less likely. The question remains: who will be authorized to guarantee refugees their durable solution after five to seven years, or, for that matter, who will have the authority to bind states to accept their fair share of global refugee burdens and responsibilities? I write all of this reluctantly as I would like nothing more than to wave a wand and make Hathaway’s vision a reality. But I do not see governments willingly ceding their authority to UNHCR or any other body. Such a supranational body would indeed be a godsend for refugees, but it is unlikely as long as a state system driven by the promotion of national interests sets the agenda.